Some riders are nearing peak form. Others are still building. Plus, there are new transfers for 2019. All this adds up to make the UAE Tour TTT a vexing puzzle. 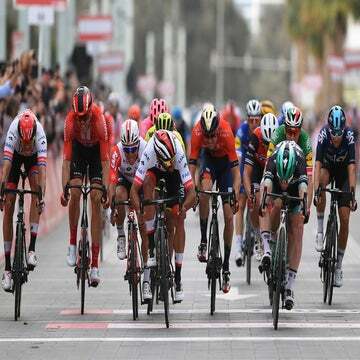 ABU DHABI, United Arab Emirates (VN) — As they dismounted their time trial bicycles and lifted the teardrop-shaped helmets from their heads, the seven members of Team CCC began to discuss what, exactly, had gone wrong. Riders gestured with their hands as they replayed the various errors during the event. The team finished seventh place during Sunday’s opening stage of the UAE Tour, a flat and fast team time trial around Al Hundaryiat Island. CCC had started fast on the short 16km course, but in the back half, the team dropped riders and hemorrhaged time. CCC crossed the line 24 seconds behind winners Jumbo-Visma. Similar scenes of frustration played out at the finish line on Sunday afternoon, as riders struggled through the first WorldTour-level team time trial of the 2019 season. Come July, cycling’s top teams will be fully trained and prepared for the Tour de France’s TTT in Brussels. But right now it’s only February, and everyone is a bit rusty. “Today is a really violent wakeup to the season,” said American Brent Bookwalter (Mitchelton-Scott). Often maligned by TV viewers for its lack of action, the TTT actually requires more skill and coordination than perhaps any other event in road cycling. The effort is akin to an endless repetition of 20-second all-out sprints. Riders must maintain their aerodynamic tuck position, even as their legs and lower backs begin to burn. And even the slightest mistake can cause a rider to lose the team’s slipstream and fall behind, or worse, send the whole group tumbling to the tarmac at 35mph. And that’s why Sunday’s race caused so much frustration for riders and team directors. The 2019 racing season is only several weeks old — Sunday’s test was the first day of racing for many riders. And the February peloton has at least two speeds. Some riders are already nearing peak form as they prepare for the upcoming Belgian classics. Other riders are just starting their respective seasons. The disparity in form often causes headaches during a team time trial. Learning to ride in a tight, aerodynamic formation also requires some practice. Most WorldTour teams hold off-season training camps in December and January where riders spend one or two days on their time trial bikes. Most of the riders who spoke to VeloNews on Sunday said they had done at least one day practicing team time trials prior to the race. There’s also the physiological effort for the event, which requires specific training. Mattia Michelusi, a coach at Team Dimension Data, said his riders often spend months doing specialized intervals when preparing for a Tour de France team time trial. The intervals include high-power anaerobic bursts for 20 to 40 seconds, followed by high-intensity blocks for a minute or more. Teams face further hurdles with new riders who have transferred in during the off-season. Those riders must adapt to the new gear and get to know the riding characteristics of their teammates, all on the fly. Often, it’s the new guy who is dropped because he simply lacks the racing experience with the other riders. Rohan Dennis, the reigning world champion in the individual time trial, said he expected to be somewhat off during Sunday’s event due to his new team. After racing for 4.5 seasons with BMC, Dennis transferred to Bahrain-Merida in the off-season. As he watched his CCC riders warm down, Stewart chalked the team’s frustrating effort in the team time trial up to a combination of both jittery legs and new riders. 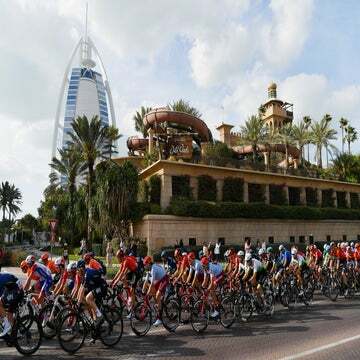 Four of the team’s seven riders at the UAE Tour are new to the squad. New blood, new season. As the CCC riders cooled down, whatever disappointment appeared to melt away as the riders talked more about the stage. Riders no longer replayed the failure — they gave high fives. Podcast: Why race bikes in the UAE desert?